In the cult classic film Office Space, a group of disgruntled office employees dream about transforming their lives but lack the courage to put their plans into action. One character believes the world is holding its breath for his greatest invention: a Jump to Conclusions Mat (see what he did there?). Although no one is convinced that jumping onto squares labelled ‘Think Again’, ‘Go Wild’ and ‘Accept It’ will aid their decision-making skills, Tom continues to fantasise about his future success. It seems a lot of people are confident their idea will be the next big thing. The results can be wonderfully irrelevant. Some aim to replace simple, common products (a table knife) that need no improvement (a banana slicer), while others are needlessly complicated or possibly injurious (a 10kg dumbbell alarm clock that requires 30 reps to switch off). It’s no surprise that in the fast-paced world of technology, many software ideas never get off the ground or become obsolete even before they get shipped or fail soon afterwards. Xenix – a Bell Labs operating system based on Unix and adopted by Microsoft. It vanished into thin air when development stopped and Microsoft quietly abandoned the idea. Adam – a home computer bogged down by early design problems. Production of Adam was announced in 1983 and then released with limited success by the toy manufacturer Coleco. One of its major faults was the tendency to erase any removable media left near it by an electromagnetic surge on start-up. Ovation – an office suite lauded by the press, hailed by Ovation Technologies and eagerly anticipated by the public. Amazingly, this celebrated innovation never actually existed. Despite the hype, the funds for its development ran out long before the company stopped trumpeting its imminent arrival. This holding pen is more like limbo, where concepts, software and other half-formed projects linger without getting to production stage. They are never officially cancelled but development and refinement slows or stops. 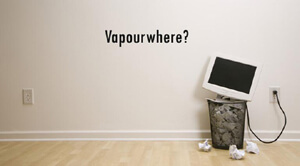 When long-term software development enters development hell it is considered vapourware (see above). Mystery software – how many, how long, how close? We’ll never know what brilliant (and not-so-brilliant) pieces of software are waiting in development hell, or if they’ll ever see the light of day. But given the colossal tech failures that precede them, maybe it’s better that way. When is something so late to get shipped that it can hardly be considered the originally advertised product? As long as 10 years? What about 50 years? How can an exciting launch become old news before it even happens? Nintendo 64DD – gaming hardware with a disk drive and endless software tweaking. Slow to appear after a slew of pre-release press conferences in 1997, Nintendo finally made a version of 64DD available by Japanese mail order 2 years later. It was discontinued in 2001, with only a handful of the many software games advertised ever available to play.